Listen to the peaceful sounds of nearby Indian Creek, wander through the many trails and common areas, and even enjoy an invigorating dip in this picture perfect creekside setting. The Elwha Place is the perfect place to get away from the hustle of the world and unplug for awhile. Luxury, modern furnishings with open concept living area and fully equipped kitchen. Roomy master bedroom has a queen bed, Cable TV and lounging chair with en-suite bath. Second bedroom has a queen bed, chair and ottoman and TV with Blu Ray DVD player for watching movies. Enjoy the views from the deck of the creek while cooking up dinner on the BBQ or enjoying a glass of wine on the swing. Take a walk and enjoy the grounds after dinner, have a campfire down by the creek, or cuddle up in front of the fireplace and enjoy a late night movie. Perfect location for taking day adventures through the Olympic National Park, visiting the west end coastal beaches and kayaking on nearby Lake Crescent. Just a short drive east to downtown Port Angeles for quaint coffee houses, bistro pubs and local seafood dining. Whatever you choose, the peacefulness of Elwha Place's surroundings will give you the refuge you seek and a relaxing place to come home to at the end of the day. Looking to rent for a Family Reunion? The whole complex can be rented and will sleep up to 15 guests. 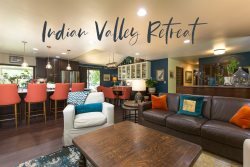 Check out Indian Creek Cottage and the Indian Valley Retreat for more information. We stayed 4 nights and absolutely loved it. The property was great and the creek out back was beautiful. Beautiful, clean, updated, comfortable. We can't say enough about it. The perfect "home away from home" to come back to after a day of exploring. The rental company was outstanding to work with too. Very helpful! I can not say enough great things about this house. The Elwha river and forest right off your back deck is magically. The home had everything you could need for an extremely comfortable stay. There was even a fire pit for roasting marshmallows. There are other rental properties on site, but when we went we had it all to ourselves. The location is fantastic if you are looking for a home base to all the hot spots in the Olympic Peninsula National Park. Wow, what a beautiful property and grounds! We were so pleasantly surprised on our arrival--not only was the apartment so well-maintained but the backyard creek and trail were an added bonus! This was the perfect locale for us to visit the different sections of the Park. Lake Crescent and the Hoh Rainforest were our absolute favorites. It was a comfort to return here after each long day of hiking. Only wish we had more time to spend in the area. Thanks for a lovely stay! This property exceeded all of our expectations! The pictures didn't do it justice as the property is absolutely breathtaking. The creek and trails are literally right behind the property and you can hear the soothing river from the back porch. We spent several days hiking different areas in the Olympic National Park and this provided a great central location. It was a comfortable place to come "home" to at day's end. Property provided a very well-stocked kitchen, beautiful bathroom with shower, and plenty of space for my husband, myself, and our toddler son. Thank you for letting us stay at your beautiful retreat! I'm glad I was lucky enough to book this getaway as a last minute surprise trip for my husband. We were able to bike out to Devil's Punchbowl on Lake Crescent, explore Port Angeles, and hike up to the peaceful Olympic Hot Springs. This retreat was the perfect mid point for a fun, laid back weekend away. It was nice to come back to a clean, comfortable and inviting place that felt like home. Thank you for allowing us the chance to stay in this beautifully decorated and maintained home! It was refreshing to be able to walk down to the creek and unwind after a long day. Justin and I enjoyed our stay so much. Thank you! Thanks for offering your beautiful property for us to stay. The kitchen was excellent and well equipped as I cooked all our meals and the creek behind the house was a soothing place to be next to while eating dinner.